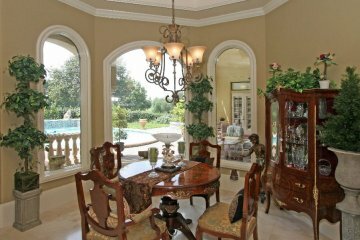 “Palazzo Mediterranean” Truly magnificent custom built in 2003 for the current owner to reflect the romance and elegance of authentic Mediterranean design. 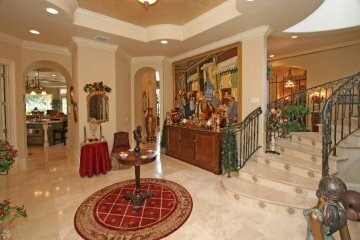 Dramatic interior with “miles of marble” flooring throughout entire first floor under soaring ceilings. First floor consists of a luxurious Master Bedroom Suite, private Guest Suite, Study, impressive two-story Living Room and formal Dining Room. Custom designed Kitchen with long serving bar opens to spacious Family Room with handsome Entertainment Center and wide screen T.V.. Double doors lead from the Family Room to a large Game Room complete with full bath, wine cooler and wet bar! A magnificent Home Theater professionally equipped with state-of-the-art equipment and three bedroom suites are located on the second floor. French doors span the entire rear of the house and open to a covered Terrace with outdoor Dining Room featuring a Fireplace and Summer Kitchen. All this overlooks a beautiful heated Swimming Pool for year-round swimming with lion-head splashing fountains – and all of this overlooks the verdant greens of the famed Isleworth Golf Course! YOUR OFFER MAY BUY THIS PRESTIGIOUS, FINELY CRAFTED HOME Financing available! Ready for immediate occupancy! The façade’s buttery yellow color and architectural elements were replicated from actual photos of Italian villas. 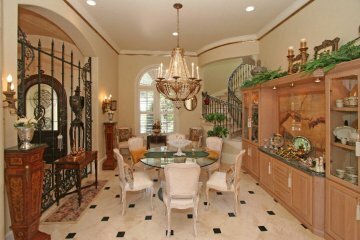 The residence is proudly positioned on approximately ¾ Acre golf front lot in Isleworth, a gated golf and country club community and one of Central Florida’s most coveted and prestigious addresses. The property is approached from a brick circular drive and walkway bordered by flower gardens and a lush formal, Florida landscape which leads to an olde-worlde cathedral style entrance of wood and iron. To greet you - a stunning marble entry foyer looking out to the verdant golf course and splashing fountains in the pool area through an enormous and dramatic two-story glass wall in the formal 24’ Grand Salon. 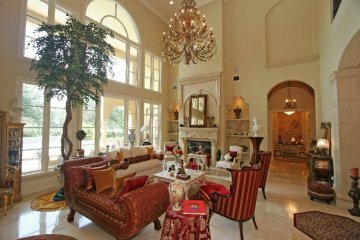 An impressive two-story stone faced fireplace in the Living Room is flanked by Corinthian columns and display shelving. Ceilings are coffered and handpainted with embellishments of elaborate moldings and carved corbels. The interior is lighted by perfectly exquisite lighting fixtures. A 25’ upper balcony banded in wrought iron overlooks the formal rooms with magnificent two-story setting. Rooms are approached through graceful arced openings and defined by stately Corinthian columns in this elegant, open floor plan, well suited for corporate entertaining or large gatherings. 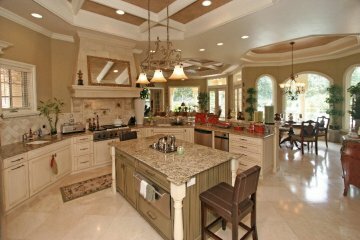 A grand Kitchen, complete with stainless steel appliances and “miles” of granite work space is a gourmet cook’s delight. The long granite snack bar, which separates the cooking and breakfast areas, is a favorite place to enjoy – especially with its views of the pool area and lush landscape. 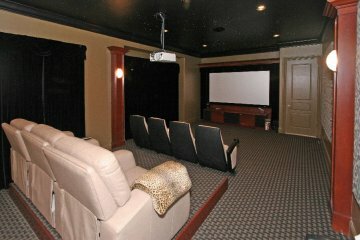 A custom Entertainment Center houses a large screen T.V. in the spacious Family Room with its French doors opening to the Veranda and the outdoor “Dining Area” with fireplace and Kitchen. Adjoining the Family room is a large Game Room complete with refreshment bar and full bath. Have your choice of bedrooms – either 4, 5 or 6, each with private bath – or use these rooms for other purposes - as the owner has done - since they are not in designated sleeping areas. Other amenities include a Theater, private one-bedroom Guest Apartment with Kitchen, a spacious rear brick Courtyard which accesses a 4-car Garage through a gated entrance. The pool is heated – Swim all year long - or just sit on the 50’ brick Veranda and overlook the lion-head fountains splashing into a refreshing heated Pool and Spa. In addition to your golf clubs, be sure to bring your boat, water skiis and fishing gear. The launch area into the famed Butler Chain of Lakes is just a moment away. Imagine the grandeur of this magnificent interior designed for beauty and comfort! Truly one of the finest estates in Isleworth Country Club. Come enjoy “Palazzo Mediterranea” ! 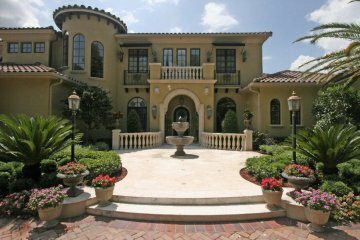 The architectural design was conceived by the renowned Mark Nasrallah and finely crafted in 2003, for the current owner, by one of Central Florida's finest builders, Jones Clayton Construction.